Get to know one of the Tent City Terrors’ newest skaters, Kitch, below. She is wonderfully, hilariously awesome! I like to keep it light hearted and happy. Usually I am thinking about what I want to eat at the afterparty. Are my thighs going to rub together too much in these fishnets? What if we all needed to breathe helium instead of oxygen to live? That would be a silly planet. What author has the best chance of taking Ernest Hemmingway in a fight? If there is life on another planet and they come here how can I get them to invest their space dollars in roller derby and spurn all other sports. Also every derby girls favorite thought excise; I just won the lottery let’s create my dream derby arena in my head. I have always wanted to join since derby was reborn. I was living in North Texas back in the early 2000’s and I regret not moving to Austin and joining up right then! 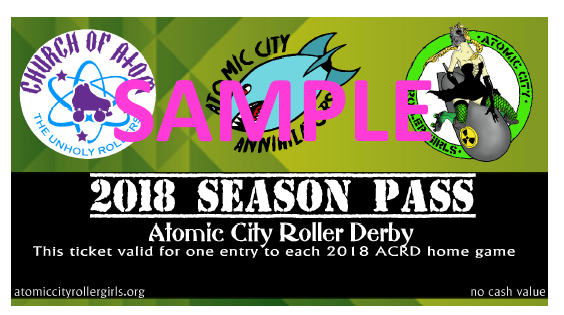 I moved to Arizona in 2007 and sent an e-mail to Arizona Roller Derby about joining but at the time you had to have 3rd party insurance to play and I did not have that. So, I started working and being really lazy for a few years. I was a complete coach potato who would always think about joining again but just pop in another movie and forget all about it. Then in March 2012 I was drunk in a bar on St. Patricks Day in Phoenix and I ran into some also drunk derby girls. Cheeks Kate gave me her phone number and the address to the practice warehouse and told me to come out the next day and try it out. When I showed up at the mattress warehouse in the middle of nowhere I thought for sure this was a plan to steal my kidneys and sell them on the black market. I even took a picture of the building and sent it to a friend in case I went missing. Luckily no back room surgeries where occurring on this day and I was able to borrow the pink skates everyone borrows their first day. I was so stoked to do it I jumped right into a drill before I even knew how to stop and promptly ran myself into a wall in order to decelerate. It’s been true love since then. What was your pre-derby sports experience? Do you play any other sports? I love to watch football. I played Tennis in high school but theatre, chess, and history club were really more my thing. Never been overly sporty and I am pretty clumsy. In fact last year I slid out on my bicycle and had to get 8 stiches in my knee. Tell us about your daily life outside of derby. Day job, hobbies? My Clark Kent persona is a social worker, it pays the bills. Roller Derby takes up most of my time and passion and I like my life that way. I have an awesome fiancee who plays men’s roller derby, Heathen. We met within the derby sphere and being a skater also he understands the time and commitment that derby needs and is always supportive of me. I like to sew, get crafty, be in nature, and go biking with Heathen. I really miss playing video games, LARPing, and D&D but Roller Derby is a jealous mistress and she doesn’t appreciate you spending that much time with another hobby. Tell us about your rookie year and what it was like learning derby? Like I said earlier I did not know how to stop when I went to my first practice and standing up on skates was pretty iffy too. Try and imagine a drunken giraffe with three ice skates on and a peg leg being chased by bees with guns. It was bad but I had so much passion about doing this I just made it a point to skate EVERY DAY. To supplement my league practices I got some outdoor wheels and started skating around Tempe Town Lake and I went to indoor skating rinks. In August 2012, five months after I started, I was (barely) drafted to the newly formed Gaudylupes. When Chaos delivered me the good news that I was going to get placed on a team I will never her exact words “We got a lot of work to do.” Understatement of the century! I was even elected Captain of my new team. So my first year of roller derby took me from drunk coach potato to Captain of a home team! Such an exciting journey. When you first joined Arizona Roller Derby, was it your goal to make the Tent City Terror roster? Absolutely but I was not sure it would ever happen. In my eyes those girls had been skating their whole lives and were just effortlessly good. The deeper I got into derby the more I realized there was nothing effortless about it. Those girls put in countless hours, blood, sweat, and tears. Just now I get to do it with them. Can you explain how it felt when you were told you’d be donning the stripes? Maria Montoya caught up with me at my car after a practice I thought just to talk. Then she says “oh and hey, you’re on the team.” It took me half a heartbeat to realize what Maria had just said to me. I had no idea this was coming. That pause in reality was probably only 1 second long but in my head it lasted forever. My face felt warm, my stomach turned, and felt this urge to start skipping. It was like when Dorothy opens the black and white door to her crashed house and the land of the munchkins comes in full color. I’m surprised I didn’t hurt Maria I hugged her so hard. It didn’t even feel real for the first 24 hours. Getting my striped TCT helmet was what really brought it home for me. I wear that thing everywhere! Share your best derby moment/memory. Besides the one with Maria I just talked about above I had a very special to me moment with H Face Killa when I very first started. I had been skating for maybe 2 months and she was running a scrimmage with another league and invited any AZRD girls to join as well. I went just to watch and maybe blow the whistle for them but you know I brought my gear ‘just in case.’ I was still cracking out of my shell at this point so I was being all shy and H Face asked me why I wasn’t skating to which I replied something about not being very good yet. H Face told me that no one cared how good I was or wasn’t, I just needed to get my skates on keep working. I scrimmaged that night for the very first time and it was so much fun! I recently met a big goal of mine, getting drafted onto the Tent City Terrors! Woohoo! My next goal is to excel in this new role, never stop learning or growing, and getting a little more physically fit. I am skating until my body ages me out of the sport and then I will just start a senior citizens league. We can do your half time shows whippersnappers. Who is your derby hero/heroes? I admire so many people it would take too long to list. There is one place where I get all Comicon fan girl Beatlemania. Somewhere in 07-09 years I would come watch an occasional roller derby game. My favorite skater back then was Deez Nutz. Sometimes it just blows my mind that I know that girl now. Hell. I’m on TWO teams with her. It’s like I personally know a celebrity. I am so much healthier now! Before derby I would go to work, come home, smoke hookah, and drink beers on the weekends. No exercise and high blood pressure. Now I have muscles, endurance, and enjoy exercising! The high blood pressure is gone completely too. Plus I am so happy now!! Have you seen how many exclamation points I have used while writing this?!? Those mean something. What advice do you have for girls who are interested in playing roller derby? Do it right now! I regret waiting so long to finally get up the courage to do it. If you don’t know how to skate at all, you can learn. If you are nervous around new people, derby is so accepting of all different sorts of people. Please know you will be welcomed. If you are scared of breaking a leg, don’t be. Just train right, stretch, and don’t overdo it. Sure accidents happen but you could also break your leg in a car accident tomorrow going to work, so you might as well be doing something you love. Also don’t listen to those people that will inevitably tell you they could never see you doing derby, you’re not mean enough, or you are not big/small enough to do derby. Screw those people! You focus on what you want and let them live in fear in their own personal cry baby pit. If you had a theme song for roller derby, what would it be?